As I exited the Chicago stop of the Brown line and stepped onto the street, I immediately saw the shot glass logo for Good Measure. The second I stepped inside the bar, I was greeted not only by the aroma of fresh burgers and sweet-smelling spices, but also by red neon lights that illuminated the bar and booths. Classic rock music seeped from the speakers above as de Oliveira, one of the restaurant managers, greeted me and sat down. She offered some samples from the menu and talked about her experience at Northside and how it shaped the life she has today. De Oliveira was a part of the graduating class of 2010 at Northside College Prep. 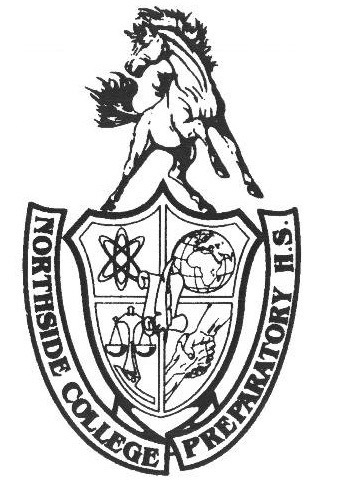 At Northside, she remembers playing soccer year round and managing the men’s soccer team. She participated in many art and P.E. classes, and took theater classes outside of school. Although de Oliveira was a highly intelligent student, scoring a 33 on the ACT and awarded a National Merit Scholarship, she felt that the type of education she was getting was not right for her. She valued hands-on education and felt that the education system implemented in the world today did not meet her needs. During her senior year of high school as college application season rolled around, de Oliveira applied to four schools. She felt that the schools she chose would be sufficient for her. After college acceptance letters rolled out, she learned that she was not admitted into any of the schools she had applied to. Her counselor was worried for her and offered different resources for her to continue her education, but de Oliveira was not worried about not going to college. She knew that it was not the right fit for her and set out to find what was. While participating in a paid internship with a Chicago theater company, de Oliveira also began working for Benny’s Chop House shortly after it opened. This is what sparked her love for the restaurant business. She continued to work there for several years as her passion grew. De Oliveira appreciated how the restaurant industry was hands-on and that she could be active in her work. She continued to advance in the industry, working in several more locations to help them start up. Although working in restaurants is her passion, she confessed to how difficult restaurant openings are. “They’re very stressful and can be very disorganized,” said de Oliveira. “It feels like an onslaught of this never ending anxiety.” There were some points where she would have to work weeks without getting a day off just to maintain the restaurant she was working in at the time. After taking a couple months off to reconnect with her family and take a break from the industry, de Oliveira started working at small, local bars around her neighborhood. As she was considering leaving the industry all together, two of her friends connected her with one of their partners, Jeff, who wanted de Oliveira to help open up a punk bar that served burgers and drinks close to the downtown area. Although she was not entirely interested in the proposal, she decided to meet with him. “One of my rules in life is you always take a meeting. You’re not going to lose anything by taking a meeting,” de Oliveira said. After meeting and agreeing that the bar should be built based on mutual values the two shared, de Oliveira joined Good Measure. When asked to reflect back on the choices that she made to get to her current position, de Oliveira recounted the importance of finding what one wants to do in their life. “If you’re not sure where you want to go or why you’re going there, don’t go [to college]. It’s too expensive. Finding your own journey is a hard thing to do, but it will serve you well,” de Oliveira said. She strongly believes in the importance of taking a gap year if you are not certain what career path you want to follow, and in that time, taking local classes to integrate with your community and to branch out. Good Measure is a bar that exhibits the values that de Oliveira and her partners share. Everybody is welcomed regardless if you’re a serious punk rocker or just somebody coming home from work. “Hopefully someone will come in here and feel seen and recognized and heard and loved and maybe they can pass that onto somebody else,” de Oliveira said. Good Measure is a restaurant that believes in the desire to not only do good onto other people, but also onto yourself. Make sure to stop by Good Measure on 226 W. Chicago Ave.